Although it’s hard to believe, there are people out there who will try to steal your Web site’s search engine rankings. Here’s a possible scenario: Your Web site is running smoothly and ranking well with the search engines for your keywords. One day, you find that your search engine traffic is dropping dramatically. Then you notice that your pages have disappeared from the search engine results pages (SERPs). This nightmare scenario could mean that your site was a victim of a 302 hijack. A 302 is a type of redirect (an HTML command that reroutes a user from one page to another automatically) used to indicate that one Web page has temporarily moved to another URL. The search engine retains the original page in its index and attributes the content and link equity of the new page to the original page. An unethical way to use 302 redirects is called 302 hijacking. This technique exploits the way search engines read 302 redirects in order to cause a Web page’s traffic and SERP rankings to be drained away and given to some other page (the “hijacker”). The hijacker is basically stealing your Web site, rankings, and search traffic. Here’s how it works: The hijacker sets up a dummy page, often containing a scraped copy of your Web page’s content, and 302 redirects it to your ranking page. The search engines see the 302 and think that the hijacker’s page is the real version, but it’s temporarily using your page’s URL. So the 302 tricks the search engines into thinking that your ranking page is the temporary version of the hijacker’s virtual page. The search engine therefore gives all of your link equity and rankings away to the hijacker’s URL. 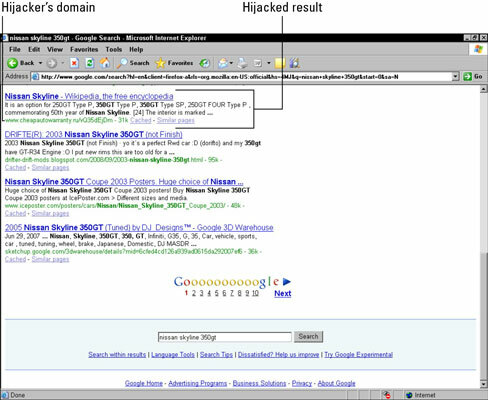 A page hijacking transfers existing search engine rankings to another URL of the hijacker’s choice. The above figure shows how a hijacked page’s listing might show in a SERP. Notice that the URL on the bottom line does not match the company name shown in the listing; clicking this link would take the user to some other page off the company’s site. A 302 hijacking can be devastating to a site, causing duplicate content penalties and loss of ranking. The search engines are aware of this issue and have all tried to put preventive measures in place. They have had some success combating this crime, but it still happens. Be on the lookout for page hijacking by regularly searching for snippets of your page text (do a search using quotation marks to find an exact match) to identify copycat pages, but you know for certain that it’s happening when you see someone else’s URL showing up on your SERP listings. If you have this problem, contact the third-party site and ask them to cooperate with you to fix the situation. Page hijacking is often accidental (through improper use of 302 redirects), so you may be able to resolve it with the person easily. If you discover that their intentions are malicious, however, you should report the site to the search engines immediately for investigation. If you’re ever in this situation, you need to contact the search engine directly. Unfortunately, there’s not much you can do to fix it on your own — the search engines have to remedy the situation for you.